Our last stop on our European winter vacation was St. Moritz in the Swiss Alps. This beautifully chic mountain town is often frequented by the rich and famous because of it's fantastic ski mountain and high end shopping. St. Moritz is one of the most glamorous destinations in the Swiss Alps. It snowed the entire time we were here and village was completely covered in a thick blanket of snow. We were lucky to see visit during this storm because as soon as the sun popped out we were able to go ski and there is nothing better than a blue bird day with fresh powder, especially in the Swiss Alps! The best way to arrive in St. Moritz is on the Glacier Express. One of the most scenic train rides in the world; the Glacier Express takes you on a journey across the entire country of Switzerland. Our journey began in Zermatt and then we climbed up steep mountains, went along frozen rivers, through massive tunnels, and over bridges in this beautiful little train. The scenery was incredible and it was one of our favorite experiences of the trip. 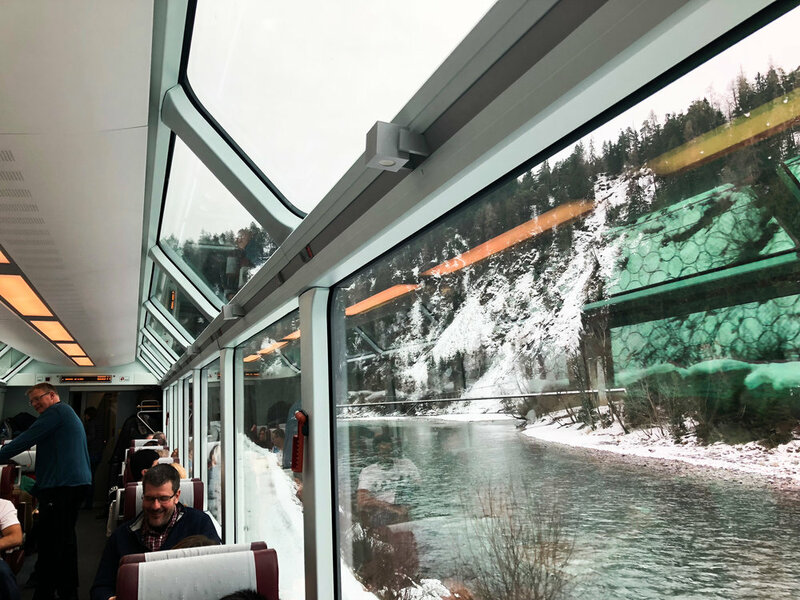 The train cars in First Class on the Glacier Express had floor to ceiling glass windows which allowed for panoramic viewing throughout the trip. It was definitely worth the money to upgrade. It was an exceptionally snowy day when we rode on the Glacier Express an the views were even more stunning. Situated on the shores of Lake St. Moritz and beneath a world class ski resort and mountain. St. Moritz is the ultimate winter vacation destination. With designer shopping, elegant spas, world renowned hotels this is where the rich come to play. If you can, visit during the holidays when the town is lit by hundreds of lights and covered in snow. The frozen lake covered in snow with the towering mountains above the town. The old town of St. Moriz. With a massive ski area that connects multiple mountains and towns with lifts and finiculars the skiing in St. Moritz is world renowned. It's one of the #1 best skiing destinations for the international jet setter. The lift to the main ski area is literally steps from downtown so don't be surprised to see people walking around town in ski boots and designer ski suits. Oh and did we mention furs, lots of furs. St. Moritz has hosted the Winter Olympics twice and had world-renowned bobsled and cresta runs. You can visit the bobsled and cresta runs easily from downtown. There were teams practicing on both courses when we visited and we got to see them whizzing around the corners of ice at top speeds of 80mph! The Leaning Tower of St. Moritz was built in the 12th century as part of the St. Mauritius Church and is one of the most famous landmarks in St. Moritz. This historic luxury hotel is the definition of elegance. With stunning lake views, multiple fine dining restaurants, a nightclub and the famous Polo Bar, Badrutt's Palace is the place to be and be seen. The towers, turrets, and butlers make you feel like royalty staying in a castle. If you are looking for a glamorous alpine getaway Badrutt's Palace is one of the best in the world. Instead of staying in one of the fancy hotels in St. Moritz we opted for a much more affordable AirBnB. It had a fantastic location right downtown and had 3 bedrooms, a kitchen, balcony with a great view of the mountains and lake, and a wood burning fire place. We were also able to walk to rent our ski gear and to the ski lift which was great. We loved this place and would definitely recommend it for a larger group, especially if you are looking to ski. Click HERE to see our AirBnB. Some of the best dining in St. Moritz can be found up the chair lifts in the mountain. These ski-in ski-out restaurants and hotels serve amazing food with unbeatable views. We ate at Hotel Salasatrain and dined on slow roasted lamb and homemade pastas. Some other mid-mountain restaurants worth checking out are Chamanna Bergrestaurnt and the Panarama Restaurant. One of the best restaurants in town is La Stalla. It has a warm and cozy atmosphere with a comforting menu. The serve traditional Swiss fondue and cheesy pasta made inside a wheel of Parmesan. We indulged and got the fondue with truffle and it was the best fondue we had the whole trip. 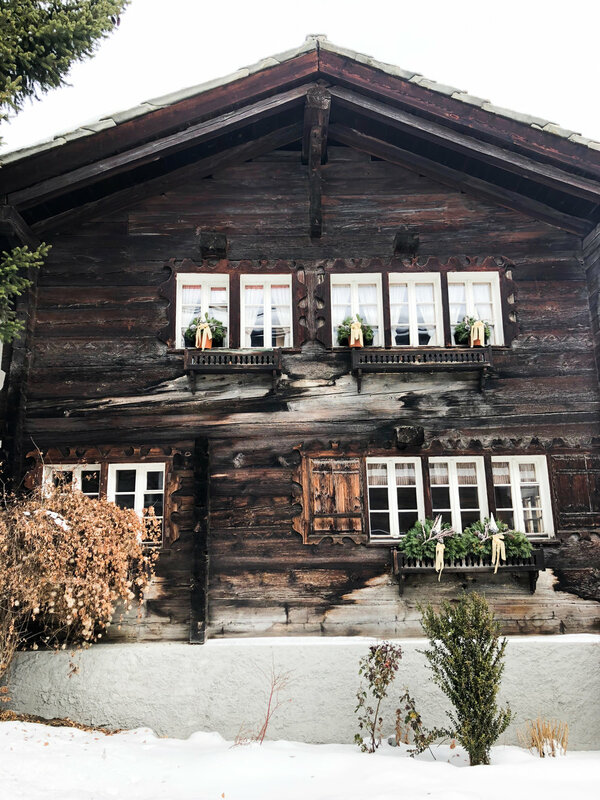 One of the oldest restaurants in St. Moritz is Chesa Veglia. 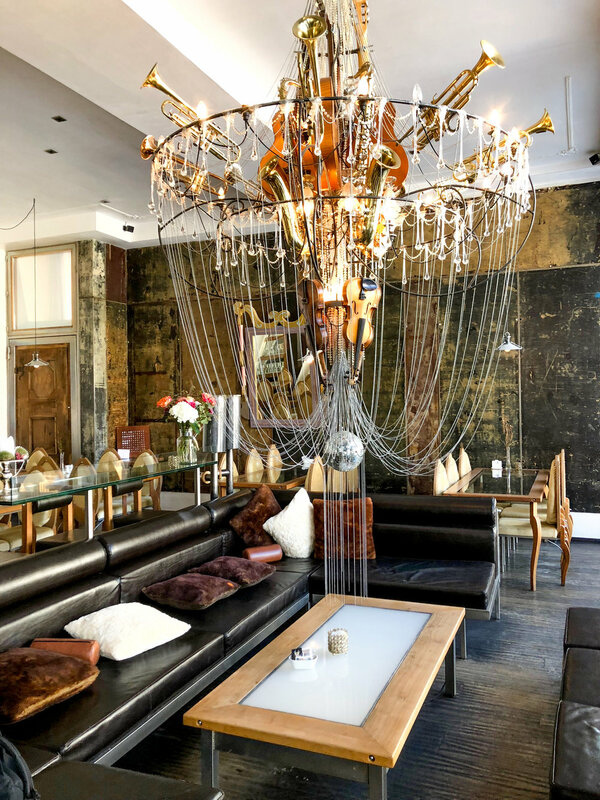 This St. Moritz institution has three restaurants and two bars. 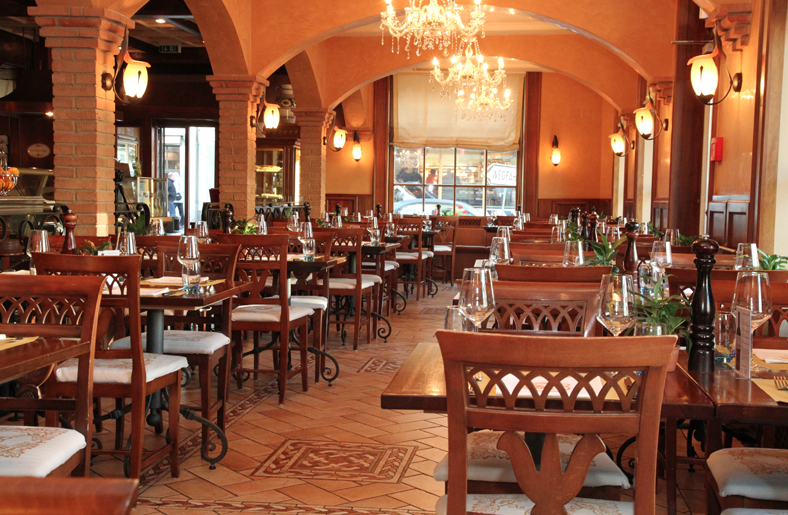 At Chesa Veglia they have been able to preserve an immaculate old school style of service. The menu was classic and definitely impressive. We saw a man order black truffle to be shaved tableside onto his dish. They used a scale to measure the cost of the shavings and afterwards placed the rare and expensive black truffle back under it's glass dome. The most famous chocolate shop in St. Moritz. Swiss chocolate at it's finest. Everything we tried here was divine. We even bought some to bring home as presents to our family and friends. We had the most fabulous time visiting St. Moritz with Angela's family. 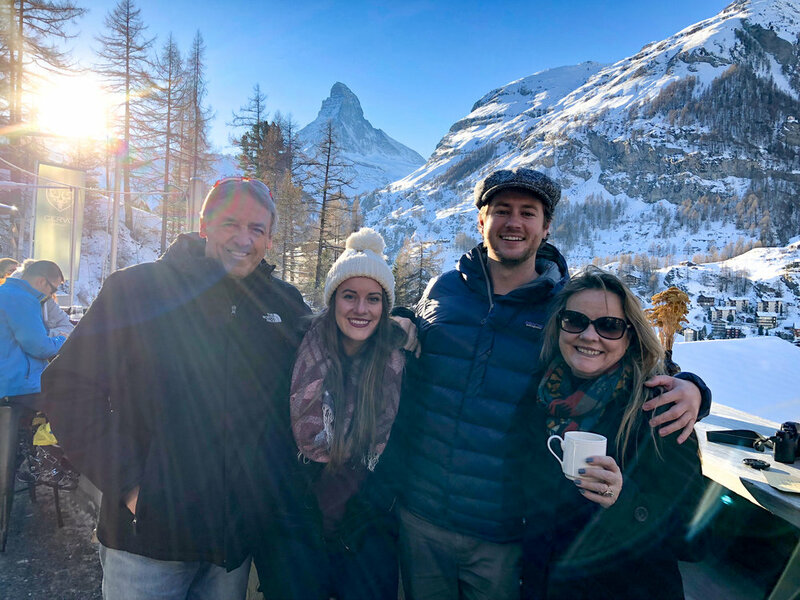 Skiing in the Swiss Alps was a bucket list experience and we are so thankful we were able to spend this Christmas holiday in Europe with our family. Under one of the most iconic mountains in the world, Zermatt sits nestled in the shadow of the Matterhorn and surrounding Swiss Alps. This charming little town is one of the most picturesque villages we've ever visited. You can stroll along the car-free streets and see a horse and carriage come by you and when you lift your eyes you will see this massive pointed mountain peak high above you. It's unlike anywhere else in the world. 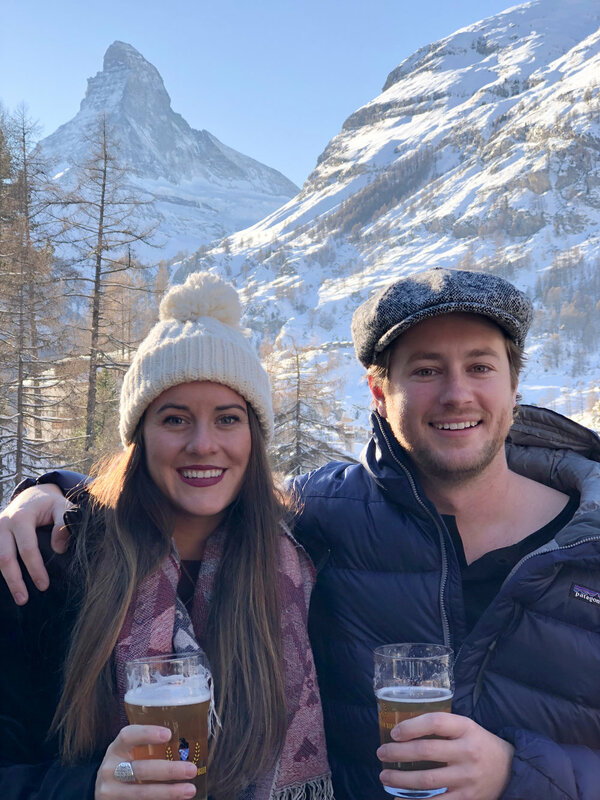 We were lucky enough to spend Christmas in Zermatt and it's an experience we will never forget. 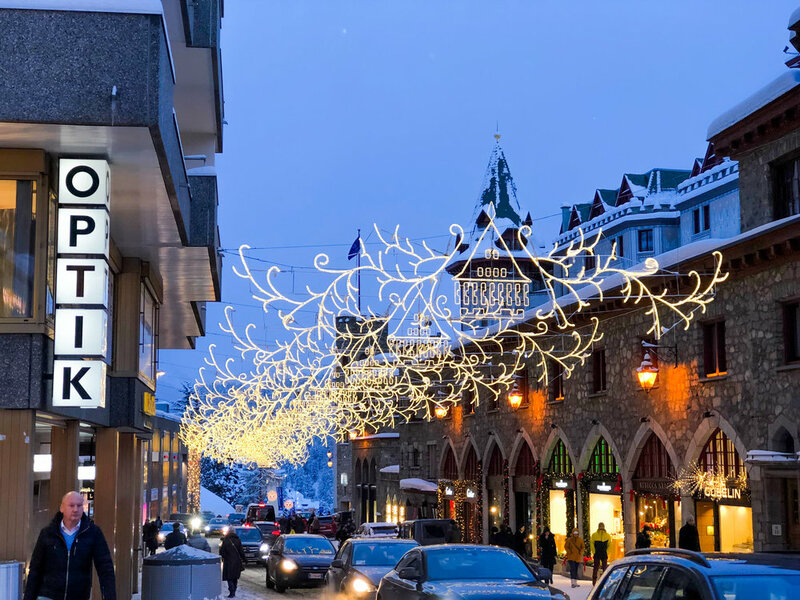 The town of Zermatt is a car-free zone which makes it extremely walkable even in snowy conditions. The Christmas decorations filled the streets and added even more magic to this beautiful little town. Zermatt is an outdoor adventurers paradise. Here you can go skiing, paragliding, hiking, sledding, snowshowing and more! 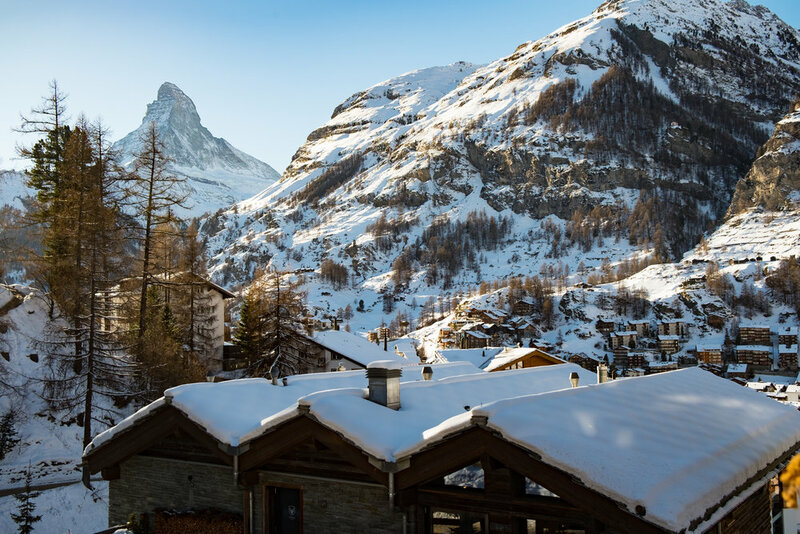 One of the main reasons we wanted to visit Zermatt was to ski it's world famous ski resort. After about an hour and 5 different trams, gondolas and chair-lifts later we made it to the top of Matterhorn Glacier Paradise. At an screaming 12,740 feet you can feel the altitude as you step out onto Europe's highest summit station. From here we strapped on our skiis and headed down the mountain. It was a bucket list experience getting to ski the Matterhorn! It was so fun to ski from that high of an elevation down to the tiny town of Zermatt below. 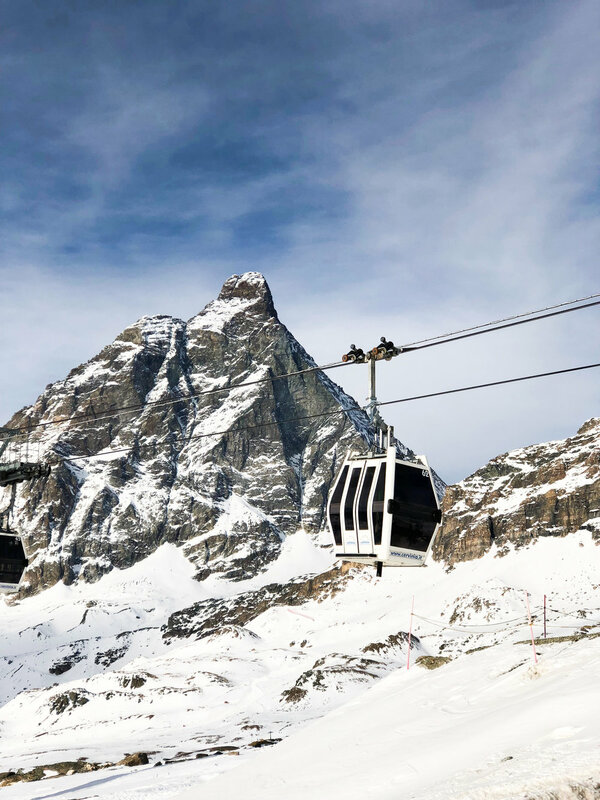 One of the coolest things about skiing in Zermatt is that you have the unique opportunity to ski in two in two countries in one day, Switzerland and Italy! On Christmas we skied over the border into Italy and had the most amazing mountain-side lunch. We had bolognese, polenta with mushrooms, and a couple nice cold beers. Beside the amazing food, the view was unreal! This was one of the most incredible expereiences of our entire trip and a Christmas we will never forget. Since Zermatt is car-free the only avaliable "taxis" are these small electric mini-buses. So cute! 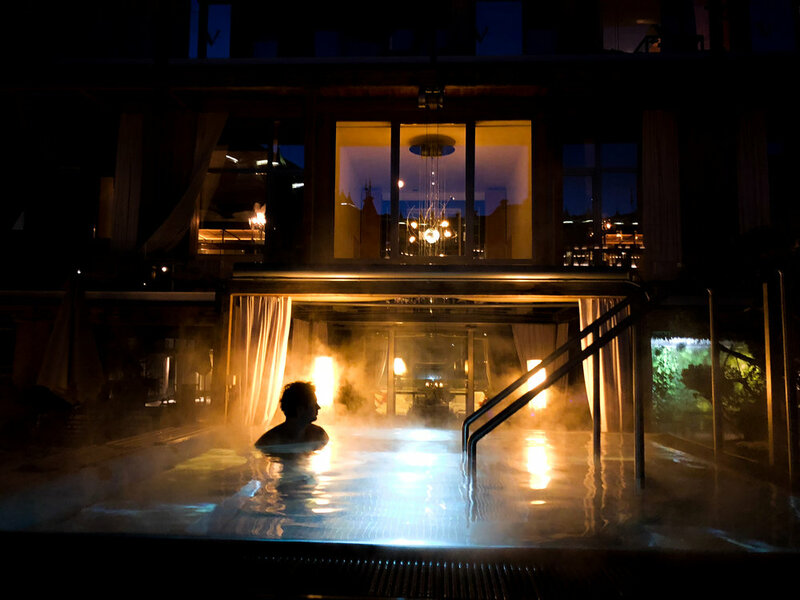 We spent Christmas in Zermatt at the lovely Backstage Boutique Hotel. It was one of the most luxurious hotels we have ever stayed at. The mountain chic vibe and impeciable service was unlike any hotel we've ever stayed at. The spa and outdoor jacuzzi at our hotel were where we spent most of our evenings. Unwinding after a long day of skiing in the jacuzzi, steam room, sauna and floating room was perfect for our aching body. And is there really anything better than being in a hot tub while it's snowing? Another thing Zermatt is known for is it's après (after-ski) party scene. Either perched on the side of the mountain on a ski-in-only location, or inside a historic hotel. 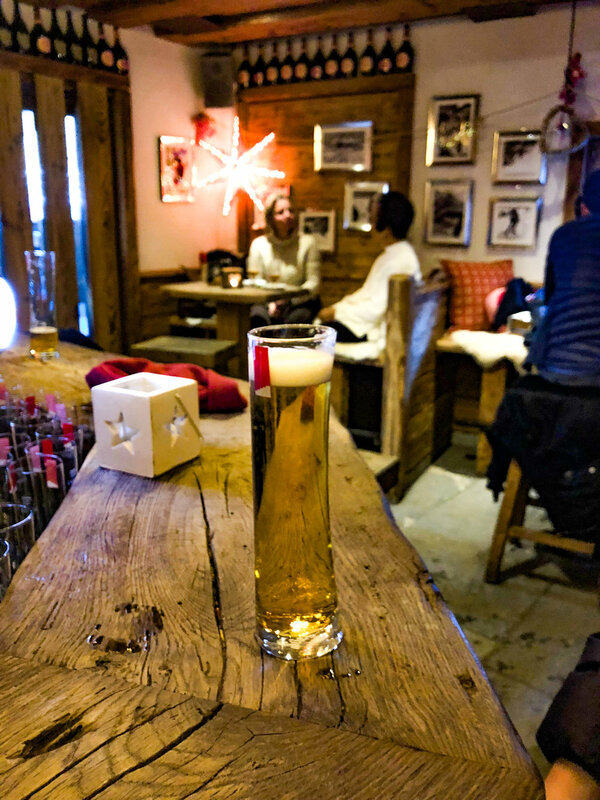 We made it our goal to find the best places to grab a drink after a long day on the slopes. Here is what we found. 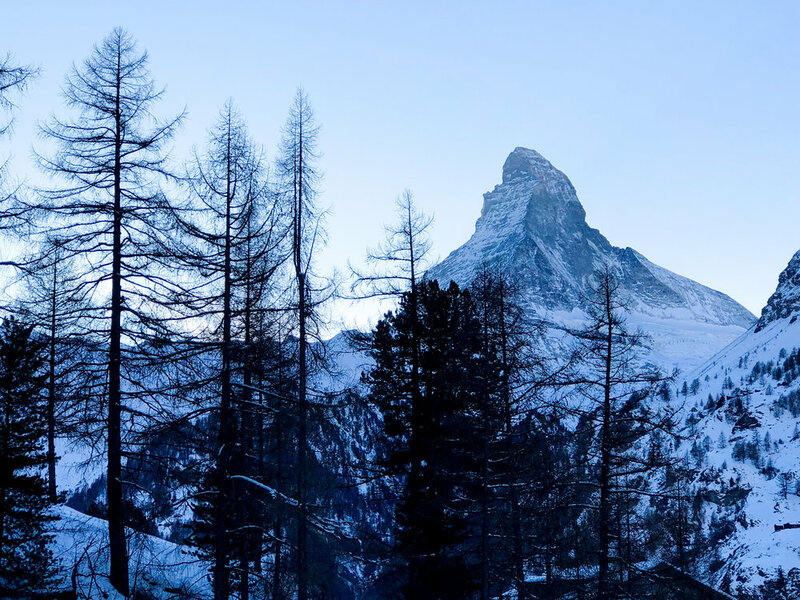 For the most breaktaking views of the Matterhorn, check out Cervo Bar. We sipped on a cold beer and ate a burger with truffle fries as we watched the sun set behind the mountain. The views here can't be beat. During sunset there was a live DJ and the music filled the air as everyone started to come down off the ski slopes ready to join in the après fun! This ski lodge is home to one of the mountains most popular après spots. You need to take the gonola up to half mountain to find this lodge but once you are there you could stay and enjoy the views all day. Zermatt Unplugged even hosts concerts and festivals here at it's amazing mountaintop location. Need to head somewhere cozy to warm up? Harry's Bar is just the place. With a warm fire burning in the corner, this chalet style dive bar is the perfect place to warm your bones after a long day on the slopes. If this doesn't work try a shot of Fernet. Another cute and cozy bar on the main street is Hexen Bar. Right on main street, we loved the decor and friendly vibe inside. We had a delicious lunch at Brown Cow Pub which has a great variety of beers and burgers. 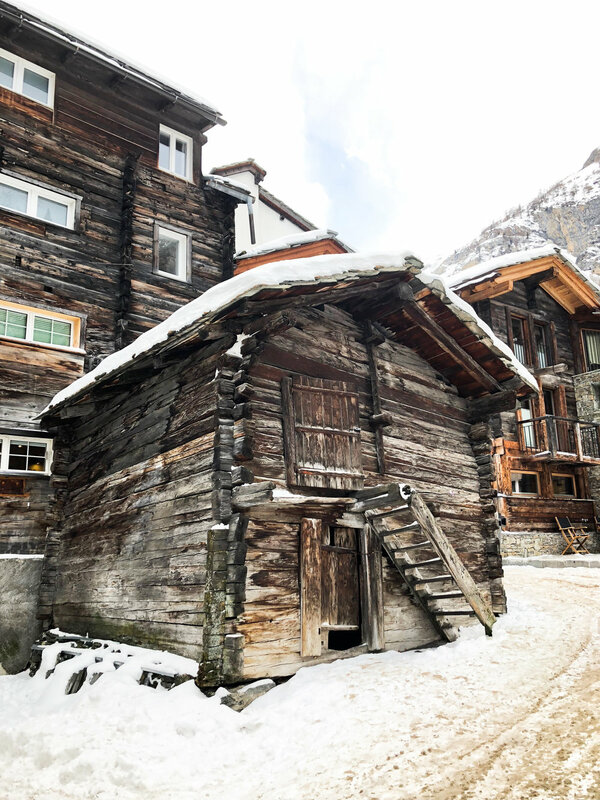 Zermatt is a magical place and these are only some of the places we were lucky enough to explore. There is an entire mountain filled with hidden champagne bars, igloos and more. We can't wait to come back one day! Located on the shores of Lake Geneva, Laussane is a elegant city situated on a sloping hill and surrounded by the Alps, towering in the distance. We were only able to spend 24 hours here and we spent the time exploring the cobblestone alleyways and shopping along locals. We visited only a couple days before Christmas so the entire town seemed to be outside shoulder to shoulder trying to buy their last minute gifts. Walking by all the colorful old buildings in the old town reminded you of being in an old movie. We stopped for a savory crepe and sipped on dry cider at Crêperie la Chandeleur which was right down from our hotel, the Swiss Wine Hotel. When the sun started to set we headed to the Cathedrale de Lausanne in the center of the old town and found the coolest Christmas market situated right outside the church. They had fresh oysters, raclette cheese, and of course wine. Inside the cathedral there were hundreds of candles lit for the holiday mass and we were able to see the priest speaking to the congregation in french. French is the main language in this area because Lake Geneva sits on the border between France and Switzerland. Although we only spent a short time in Lausanne but we had a fabulous time and would love to come back one day. Next stop, to the cutest little mountain town in the Alps, Zermatt for Christmas! 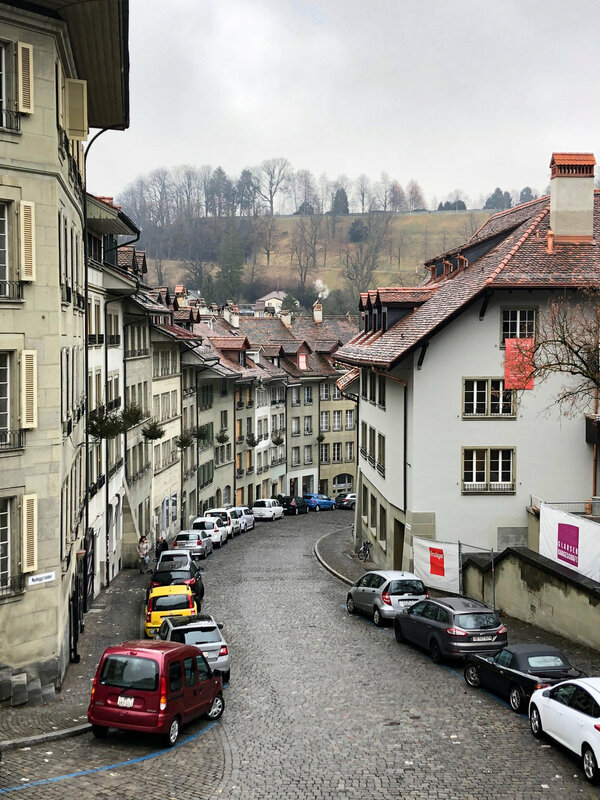 Our first and last stop on our European Christmas trip was Zurich, Switzerland. 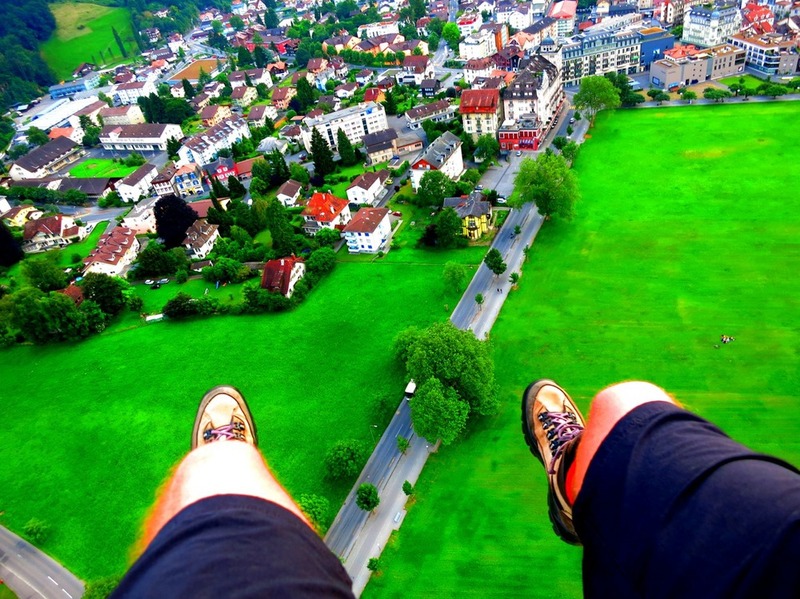 We flew in and out of Zurich and thought it was the perfect home base. The train station is located downtown near the waterfront which makes everything walkable. 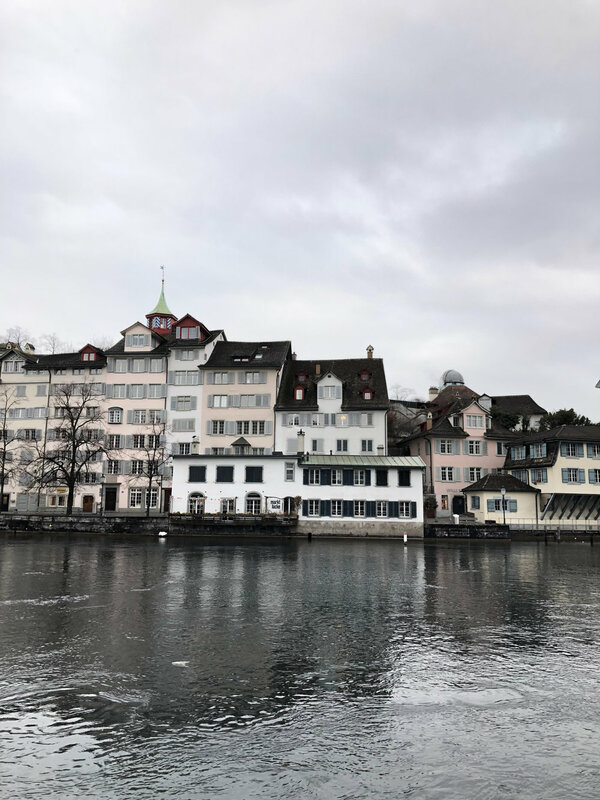 The old town of Zurich is located along Limmat River. 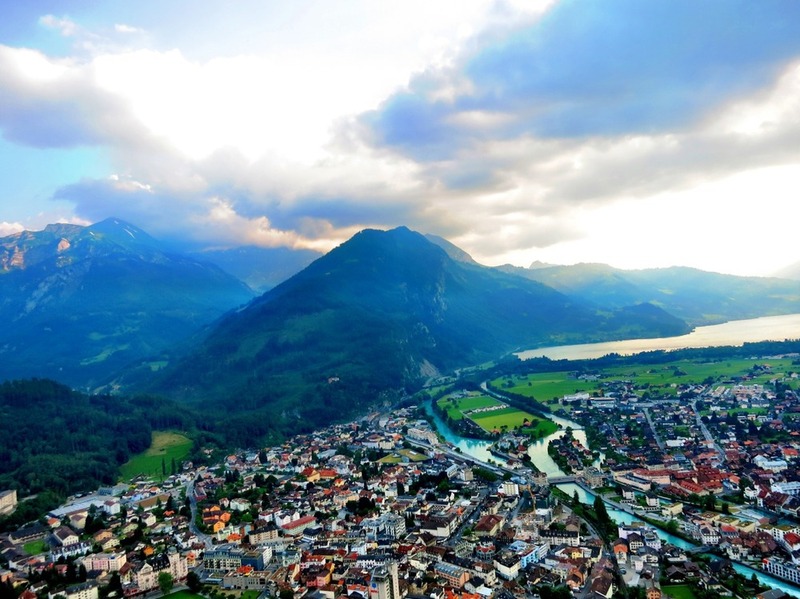 Here you can walk along the promenade and admire the colorful buildings until you reach Lake Zurich. If you want you can catch a boat here which will take you out on the water, giving you a different view of the city and surrounding mountains. We visited during Christmas and it seemed the entire town was celebrating. All the stores were covered in decorations and the streets were glowing in lights. The main Christmas market was located in the train station. Inside there are tons of different stalls selling food, mulled wine, presents, toys and other artisan gifts. In the center of the train station there is a giant Christmas tree covered in magnificent Swarovski diamonds. We loved exploring the train station Chistmas market. Once you head back outside take a stroll along the winding cobblestone streets in the old town. Around every corner you will find Christmas stalls serving raclette and more gluhwein. The entire old town is it's own Christmas market and it's a lot of fun to explore at night. The best meal we had in Zurich was at Zeughauskeller. This historic restaurant is located right in the center of town in an old armery. They serve traditional Swiss/German fare and are famous for their schnitzle and homebrewed beers that come in large 1 liter glasses. This place has been serving declisious food for generations and is famous in Zurich. Expect to wait in line when you arrive, but trust us it's worth it. 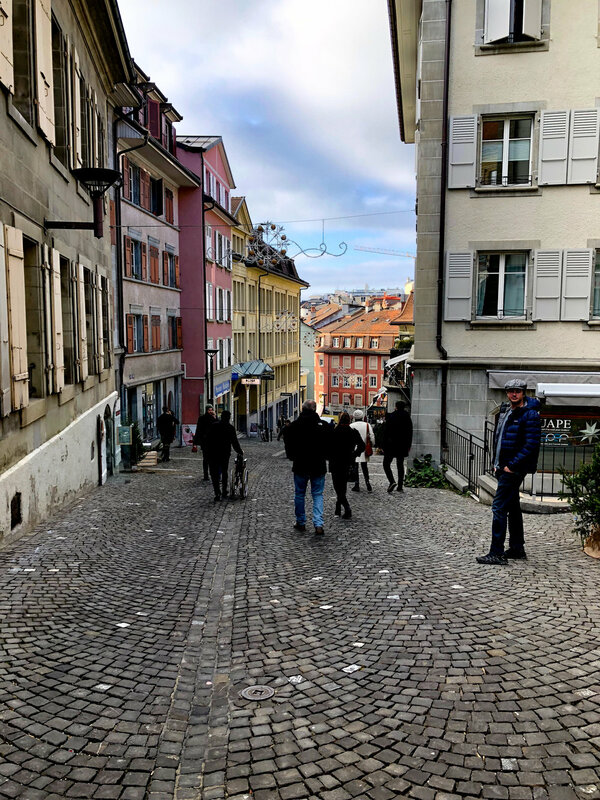 We had the best time in Zurich but were ready to move on to our next destination. Colmar in France! Another lake we visited in Switzerland was Lake Lucerne. 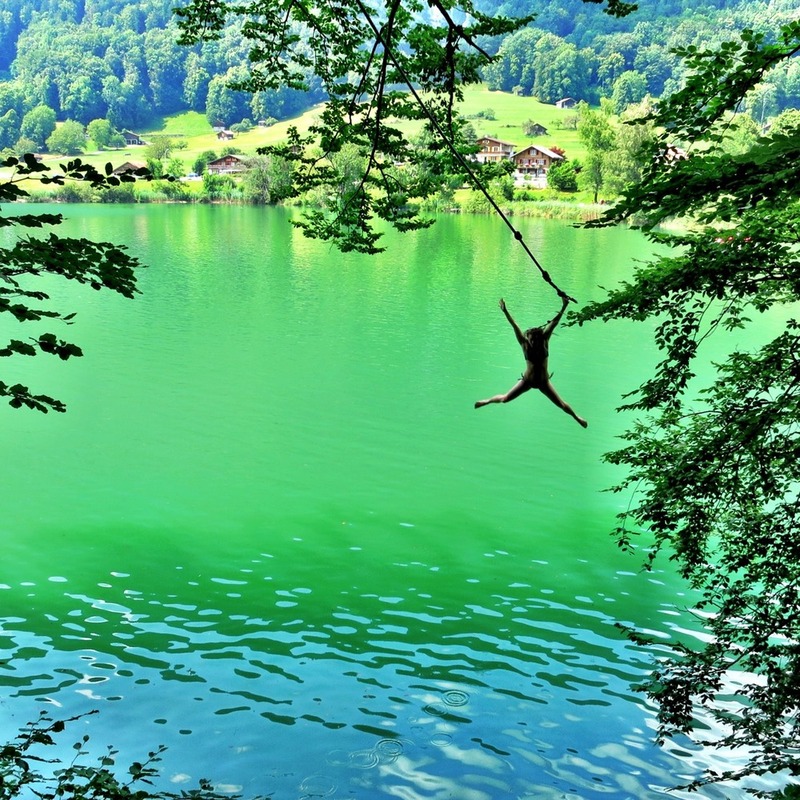 Lucerne is a gorgeous lake surrounded by mountains with a charming old town, everything you want in a Swiss town. We spent one day relaxing at this humongous park next to the beach. It was packed and reminded us of Dolores Park in San Francisco on a sunny day. Besides picnicking there were frisbees flying, kids walking on slack lines, and the most popular activity kicking a soccer ball around. One of my favorite things we did in Lucerne was go to an open air cinema. Luckily they were playing Argo, and in English. We barley had enough Swiss francs left to buy our tickets to the movie and while I am struggling to get all my coins out of my purse a nice man come up to us and says, "Hey I have two free tickets if you want them." Safe to say we were ecstatic and got to go for free! A big thanks to whoever that guy was. The weather was gorgeous and we sipped on some Swiss beers, sat back and watched the movie with Lake Lucerne in the background. Date night in Switzerland! Lucerne was our last stop in Switzerland, on to Germany.